Spring’s here - well almost! See our 10 easy and green spring-cleaning tips from Recyclebank, the incentives and behavior change platform focused on waste. Whether you’re focused on getting organized or just want all your household surfaces to sparkle, these tips are sure to help you green the way you clean out and clean up. Recyclebank recently partnered with Phoenix, the nation’s sixth largest city on its waste diversion initiatives, and through various tools, including engaging educational content and recycling rewards, the company motivates behavioral change among residents across the nation. 1. Overhaul your closets. If you’re among the many cleaning out their closets this spring, you can upcycle or donate all of that old clothing (and linens). Or, you can even host a clothing swap in your community to find a new home for your old clothes, and gain a few new pieces for yourself. 2. Narrow down your library. Are there a few too many books taking up space in your home? Consider recycling them (if they’re paperbacks), up cycling them into cool décor, donating them to schools or neighborhood libraries, or hosting a book swap the same way you’d host a clothing swap. 3. Get rid of outdated technology. Still have shelves and boxes full of CDs or VHS tapes? It might be time to surrender to technology and let them go. Like books, there are ways to donate or recycle them, BUT, you can also sell them and put that money towards the technology you’re replacing them with. 4. Crack down on kitchen cabinet clutter. Maybe the kitchen is the real clutter culprit in your home, and it’s time to retire those old mugs, plates, pots, pans, or utensils. If this is the case, you can reuse some of these kitchen items to organize your closet, like turning teacups, saucers, and cheese graters into jewelry holders. Killing two birds with one stone. 5. Reassess bathroom storage. Are your bathroom cabinets overstuffed to the point of causing an avalanche each time you grab your toothbrush (or does that only happen in movies)? Even if they’re not, there might be some items — like old cold medicine and expired prescriptions — lurking in there that can and should be tossed during your quest to de-clutter. Don’t toss them in the trash, though: Once emptied, many of those medicine bottles can go right in the recycling bin. 6. Spring for sponges and reusable cloths instead of paper towels. Not only do sponges and cloths save on waste, they are more likely to stand up to a tougher scrubbing than paper towels will. 7. Reach for reusable dusting cloths vs. disposable ones. Cloths and dusters made of microfiber are very effective at trapping in dust, even when dry, and can be machine-washed and reused over and over again for all of your dusting needs. Looking for another way to double up on your waste-reducing spring-cleaning efforts? You can up cycle some old shirts from your closet purge into dusting cloths! 8. Opt for multipurpose cleaners. One solution to clean it all. There are many diluted cleaning solutions out there that can be mixed with water and used for dishes and windows and tile floors, reducing the amount of cleaning supplies you need and even cutting the clutter in your cleaning closet! 9. Choose green cleaning products to avoid harmful waste. Cleaning products that use toxic chemicals could be considered household hazardous waste, which means they can contaminate other recyclables if not disposed of correctly. 10. 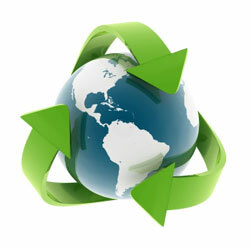 Recycle green cleaning products and packaging. If you decide to choose green cleaning products that are free of harmful chemicals, you’ll still end up with an empty bottle at some point, so be sure to recycle it with the rest of your plastic recycling. For larger junk or garbage, you may want to hire a junk removal service that recycles your waste.